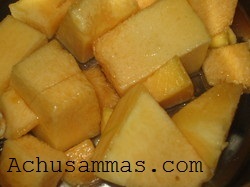 · Pressure cook pumpkin with enough water till becomes soft. Remove lid and mash the pulp well. 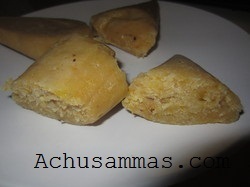 · Melt jaggery in a heavy bottom pan. 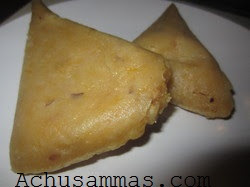 · Take a bowl and add the rice flour, rava, coconut slices, cardamom powder, salt, mashed pumpkin and mix well enough to form soft dough. · Places small amount on each leaf and wrap well. · Steam it for about 20-30 minutes. i cant open ur pages.i dont know wat happend? Wow interesting and yummy dish! 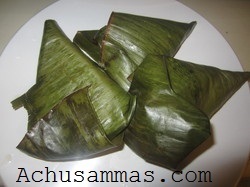 this is something very very new to me...........it looks so interesting,nd cooked in a banana leaf..super! 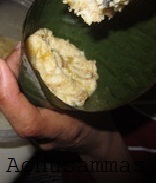 Wow...Appam looks so delicious.......I can taste them through the clicks...lovely clicks dear. wow..this looks amazing..must have tasted divine..wonderful recipe dear!! So tasty and love to try this! 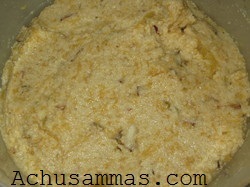 Innovative recipe,sounds healthy and delicious..
WOw wat a super delicious ada,wish you send me some.. 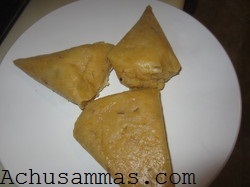 Delicious adas,never tried with pumpkin..yummy! Excellent dish, I love pumpkin, it gives such a great taste to most dishes. This is very new to me, looks very delicious..
looks so flavorful and authentic. Wow, this recipe is really very tempting. Never tried using pumpkin like this! wonderful recipe..must be very delicious too..very inviting!! new to me....looks so yummy.. This is totally new to me looks so good and filling.